Whether you are a veteran of the Italian Campaign in the Second World War, a related family member, ally, supporter, or not, please accept a warm and timely welcome of thanks for visiting us. The Association was founded in 1987 by the late brothers, Eric and Maurice Cheadle, veterans of the North African and Italian campaigns. Amongst its constitutional goals are to give a true history of the Italian Campaign and, perhaps most importantly, to keep alive that special bond of comradeship which existed during the Campaign. Within the pages of our site, you will find more detailed information, such as reports on events, photographs, personal histories and reminiscences from members and families, about the Association, the Italian Campaign itself and its impact on history. On reading, we hope you will sense encouragement, discovery, truthful representation as well as deep satisfaction in what is written. look around the mountains in the mud and rain; see the scattered crosses, some which bear no name; the heartbreak and sorrow are all gone, the boys beneath them slumber on; they are the D-day dodgers, who’ll stay in Italy. Anzio – a disaster waiting to happen? 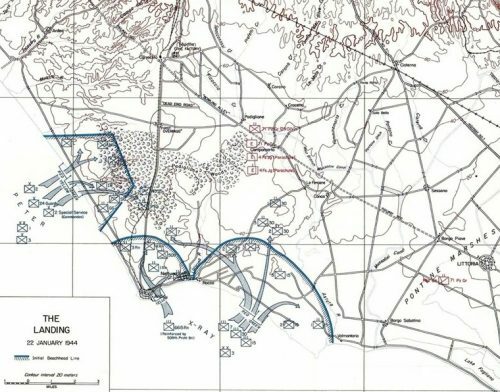 The Anzio landings on 22 January 1944 were essentially designed as part of a grander scheme to unlock the stalemate and slaughter taking place further south. Since landing at Salerno on 9 September 1943, the Allies had been pushing north towards their objective – Rome. Unhappily, in November and December 1943, as the Allies broke into the very outskirts of the Gustav Line – an 81 mile defensive position that ran from Minturno on the Tyrrhenian Sea to Ortona on the Adriatic, they discovered an immovable object – Kesselring’s German Army, who had had four months and 40,000 pressganged Italians, to build very strong defences. Both the US Fifth Army in front of Cassino and the Eighth Army clambering across the River Sangro were suffering appalling casualties for very little progress. 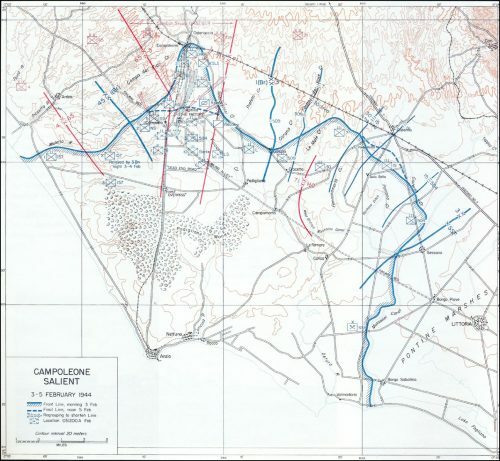 On the Fifth US Army front, huge feats like the seizure of Monte Camino, Monte La Difensa, Monte Lungo, Monte Sammucro and the village of San Pietro Infine had clearly demonstrated that the Gustav Line was intended to stop the Allies in their tracks. Allied suffering was immense. A new plan was called for. Mark W Clark, as Commander Fifth US Army, and under strong pressure from Winston Churchill, decided that landing behind the Gustav Line with an amphibious invasion at Anzio was the solution to his troubles. He would get behind the Gustav Line and, in doing so, force a German withdrawal from it. The tricky bit was that he was quite unable to deploy the full force of his available troops to this amphibious task because of what became known locally as ‘the curse of OVERLORD’. This operation, to land a massive force in Normandy, was the Allied priority and, for that to have every chance of success, precious shipping from across the globe was required. Large amounts of shipping, previously used in Mediterranean operations was starting to return to the UK and US for refurbishment in preparation for Operation OVERLORD. This meant that the shipping ‘lift’ available for the Anzio operation was limited to two infantry divisions and a special force brigade. The tragedy is that despite his senior, highly experienced commanders’ tearing holes in his plan, and clearly spelling out that the size of the force would not have the desired effect of causing a German withdrawal from the Gustav Line, Clark still went ahead of it. Worse still, recognising the weakness of his Anzio plan, he committed the remainder of his force on the Gustav Line to some near suicidal operations that were intended to draw German reserves south and keep them away from Anzio. And so, on 22 January 1944, VI (US) Corps, under the command of John Lucas, dutifully landed as ordered: 1 British Infantry Division to the north of Anzio and 3 US Infantry Division to the east of Anzio at Nettuno, with the special force brigade seizing the small port. The landings went without a hitch largely because the Germans were completely unaware of them. The Allies had achieved operational surprise. The next question therefore was what was Lucas going to do about the operational surprise that he had been blessed with. 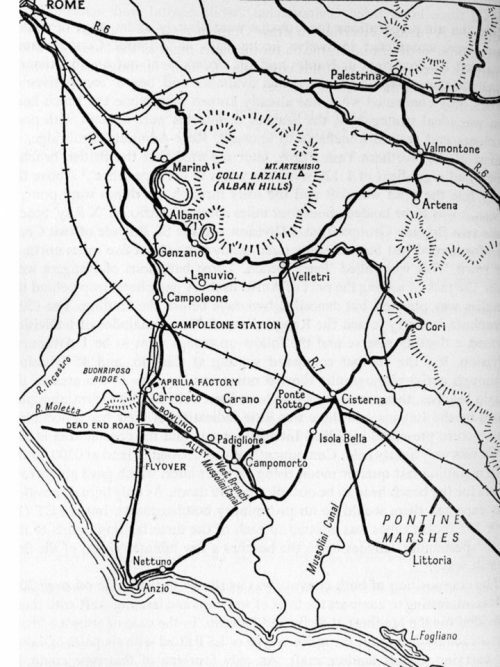 Lucas, strongly influenced by what happened at Salerno in September 1943 where inadequately supported US infantry had made a headlong thrust inland towards the surrounding hills and paid a very heavy price for their adventure – for which his predecessor had been sacked, decided that a headlong thrust towards the Alban Hills so that he could overlook and dominate Rome, was not a good idea. He decided to stay put and build up his forces and logistics tail until he was confident that any breakout would be sufficiently powerful and could be sustained over a long period – largely because he, like everyone else, recognised that he was on his own and could not expect the troops bashing against the Gustav Line to be meeting up with him overland any time soon. Unfortunately for Lucas the price of siting tight, was that Kesselring able to quickly surround the beachhead with elements of seven German divisions. Winston Churchill was appalled by the days of inactivity as Lucas steadily built up his manpower, stores and equipment. His response was to lean on Harold Alexander commanding 15 Army Group who, in turn, lent on Clark. He, in turn, lent heavily on Lucas. After much discussion, Lucas was ordered to breakout with the forces that he had at his disposal in the beachhead and thrust into the Alban Hills. This he did on the night of 29-30 January 1944 with elements of 1 British Infantry Division pushing up the Anzio-Albano road towards Campoleone and elements of 3 US Infantry Division pushing up the Conca-Cisterna road towards Cisterna. Both met with disaster. Whilst the US operation achieved nothing except kill and main large numbers of Rangers, the British operation created a weak salient deep into German lines. The tricky bit with salients is that they are notoriously difficult to defend because all sides except the base are exposed and need large amounts of troops to picket the newly created perimeter. Lucas did not have large amounts of troops – indeed, for the size of the task, he had pitifully few. With very little threat from the US sector, the Germans focussed their attention and resources on the new British salient and steadily pushed it back with counter attack after counter attack. By 15 February 1944, they were pushed as far back as the ‘Flyover’ – what the Allies decided would be their Final Defensive Line. 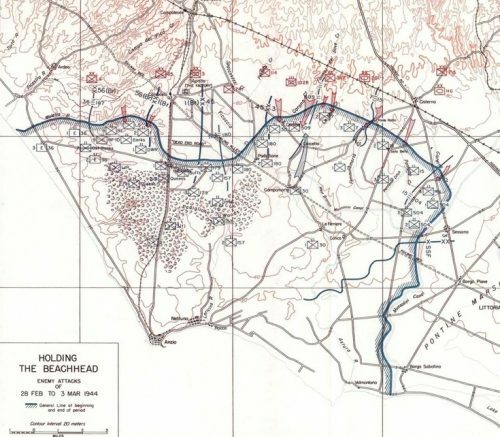 Clark rushed 56 British Infantry Division and 45 US Infantry Division to the scene in an attempt to shore up the defence but most realists recognised that the beachhead was now in deep trouble. The likelihood of the Final Defensive Line giving way was high especially as ULTRA intercepts were telling the Allies that Hitler was now involved and sending troops to Anzio from the Balkans, Hungary and France. Map 4. Holding the Beachhead. Hitler had recognised the potential at Anzio. To push Lucas back into the sea would clearly demonstrate to planners working on Operation OVERLORD that the Allies had still not mastered amphibious operations. The sheer scale and complexity of Operation OVERLORD meant that it was a one-time only event that the Allies could not afford to get wrong. To fail at Anzio would be to put a successful Operation OVERLORD in doubt. In effect, both sides just had to win at Anzio. As a result, the Allies put some of their enormous ‘lift’ requirements for Operation OVERLORD on hold and diverted that shipping to rush soldiers and equipment into the beachhead. 5 British Infantry Division were the next to go in. The net result of this increase in Allied force levels at Anzio in February and March 1944 was that the beachhead held and the front stabilised. The massive German counter attack that started on 16 February 1944 was held and by the beginning of March 1944 had simply run out of energy. However, the Allies had insufficient energy to take advantage of this and so the beachhead entered a two and a half month period of stalemate. During this period, Clark sacked Lucas and replaced him with Lucien Truscott. For the Allies, that stalemate period was one of unremitting drudgery and horror. In the British sector, the front line that they had established and dug in on, was comparable to some First World War battlefields. Casualties in the ‘Wadis’ mounted but there was no respite because the Germans controlled all the high ground in the Alban Hills and Lepini Mountains from where they directed all their guns – and anything Allied in the beachhead was considered fair game including Evacuation Hospitals. Despite continual German bombardment, clever VI (US) Corps logistics and the plenty that Uncle Sam unselfishly provided, ensured that the beachhead was not only able to hang on but also to build up enormous stocks especially of tanks, fuel and ammunition. This needed to happen if any breakout was to be possible at some point later. The Allies also started to bring in new Divisions and remove tired ones. Out went 56 British Infantry Division and in came the rest of 1 US Armoured Division, the Special Service Force, 34 US Infantry Division and 36 US Infantry Division. Map 5. VI (US) Corps breakout. Breakout time came with Operation DIADEM in May 1944. 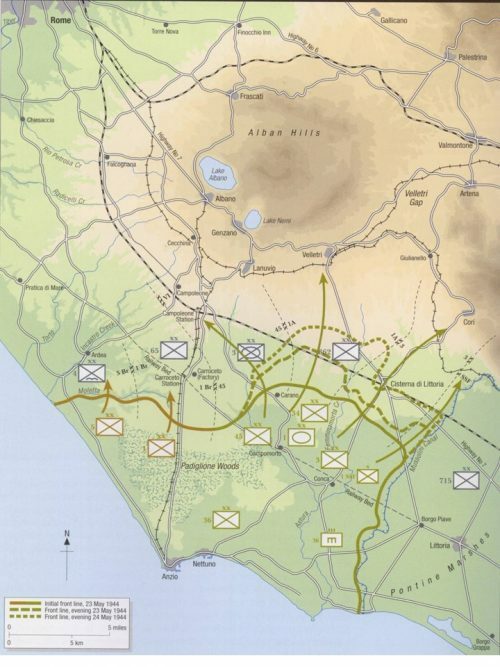 Alexander’s plan, which involved moving the entire Eighth British Army, with the exception of V (British) Corps, from the Adriatic to the Tyrrhenian Sea and reducing the frontage for which Fifth US Army was responsible to just the coastal sector around Minturno, was to breakthrough at Cassino and drive up Route 6 towards Rome. At a time to be decided depending on how successful this assault was, he would then launch the breakout from Anzio towards the Velletri Gap and a small town called Valmontone which sat astride Route 6 and just south of Rome. Here the Anzio breakout force would stop, turn its guns and tank barrels south and destroy the German Tenth Army as it withdrew northwards under pressure from Eight British Army driving up from Cassino. The massive 11 May 1944 Cassino operation was a success and the Gustav Line was breached on 18 May 1944 so Alexander ordered the Anzio breakout to start on 23 May 1944 at exactly the same time that 1 (Canadian) Corps attacked the Hitler Line – the Germans’ next line of defence six miles north of the Gustav Line. Truscott’s 23 May 1944 breakout towards the Velletri Gap sustained enormous casualties but so much force, and the logistic wherewithal with which to fight, had been shepherded into the beachhead, right under the Germans’ noses, that it was unstoppable. On the night of 24 May 1944, Truscott was confident of being astride Route 6 at Valmontone with ample armour and guns sometime on 26 May 1944. Here, he would complete Alexander’s intent for Operation DIADEM and the German Tenth Army would be destroyed. 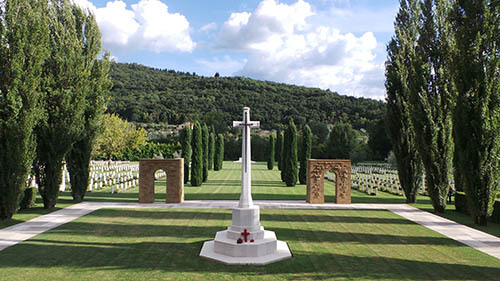 Then, on the morning of 25 May 1944, Clark ordered Truscott to switch the direction of his breakout away from Valmontone towards Campoleone – the very place where 1 British Infantry Division had come a cropper way back on 29-30 January 1944 and then endured the high drama of the salient battles. Clark wanted US troops to be the first in Rome and saw the Anzio-Albano road through Campoleone as the fastest route. Truscott saw the stupidity of this change – VI (US) Corps would be attacking the strongest part of the German Caesar Line, but he was unable to change Clark’s decision. Truscott was required to remove 1 US Armoured Division from its axis towards Valmontone, detach it from 3 US Infantry Division and pair it up with 45 US Infantry Division instead. This took time to sort and weakened 3 US Infantry Division so much that the Herman Goering Panzer Division got to Valmontone in force first and kept Route 6 open for the Tenth Army to escape north of Rome. For four crucial days, VI (US) Corps battered itself to a standstill against the German defence line around Campoleone and it was only the brilliance of Fred Walker commanding 36 US Infantry Division that finally unlocked that line. His Division saw an opportunity to drive armour and infantry up the side of Monte Artemisio in the middle of the night, a hill feature almost equidistant between Campoleone and Valmontone and very thinly manned by Germans, and daringly took that opportunity. This completely unlocked the Caesar Line and compelled the Germans to fall back beyond Rome and the River Tiber. On 5 June 1944, Clark got his wish and US troops entered Rome. Two controversies linger from the Anzio landings. Firstly, Lucas, portrayed as a plodding, uninspiring commander who lacked the offensive spirit to make the rush for Rome when he had the advantage of operational surprise, has come out of it very badly. My view is that his reputation needs to be restored – something he was unable to do because he died of cancer in 1949 as the US Official Histories were being written. His decision not to advance on Rome, given the small size of his force and his vulnerable logistics tail that would stretch right back to the beachhead if he advanced, was the right one. His decision to stay put and build up his supplies – particularly artillery ammunition, allowed him to parry the gigantic German counter attacks that came at him in February and early March 1944. He fought the Germans to a miserable standstill and the beachhead – that four month thorn in the German side, survived. Ultimately, its survival allowed Alexander to design Operation DIADEM and plan the destruction of the German Tenth Army to the south of Rome. Clark turned a potentially brilliant success into an Allied catastrophe and, in allowing the German Tenth Army to escape, sowed the seeds for the establishment of further German defence lines all the way up Italy during the remainder of the war. The Allies were going to pay dearly when attacking and overcoming those defence lines. But that is another story.